Asian Man is closed on Wednesday. Though I usually trek down there for a bit to do some kind of catch up on something I've been putting off for weeks, months, even years? Yeah, it's crazy how procrastinating is my forte. I'm good at it. But for the last two weeks I've forced myself to stay at home and do work around the house. Other things in my life that I have also been putting off. Again, stuff I'm good at. I got a letter from an acquaintance who is currently in Lebanon visiting family. He sent me this picture of someone who lives in the same building as his familia. What's the significance you ask? Well, look carefully. It's a POTSHOT shirt. A band on my label from TOKYO, JAPAN. 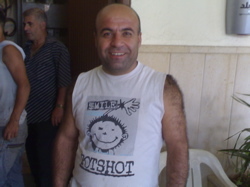 How in the world did this shirt make it to Lebanon? And how did this guy get the shirt? Who knows? But it's amazing.